Washing the windows adds instant light into your home and is a great DIY project for this weekend. I’ve heard all sorts of ways to clean my windows like using newspaper or vinegar but I’m not sure if that’s the best way to get them really clean. How should I clean my windows like a professional? If you’ve ever thoroughly washed your windows, inside and out, you’ve experienced the unexpected thrill of having so much more light enter your home. With super-clean windows it’s as if the inside of your home is transformed. And like many of your other weekend chores like laundry or weeding, washing your windows has that instant feeling of reward. 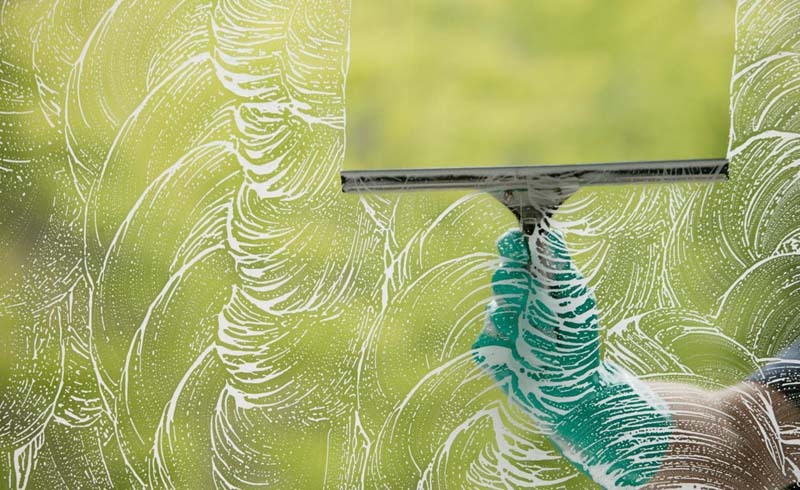 Most homes should have their windows cleaned about twice a year, once in the spring and again in the fall. Of course your specific climate will help dictate how often and when. But if it’s been awhile since you’ve had your windows cleaned, spring is a great time to get it done. Before you begin, be realistic about which windows you can do yourself and which windows you should have a pro do – you might have high windows that aren’t easily accessible. Only a pro who is experienced with climbing roofs and ladders should consider washing these areas; many homeowners fall off ladders and roofs trying to reach awkward spots and you don’t want start your spring cleaning at the hospital. Although there are many ways to get your windows clean, using soap and water is the quickest and easiest way to remove dirt, mud, water spots or the more difficult, bird poop. 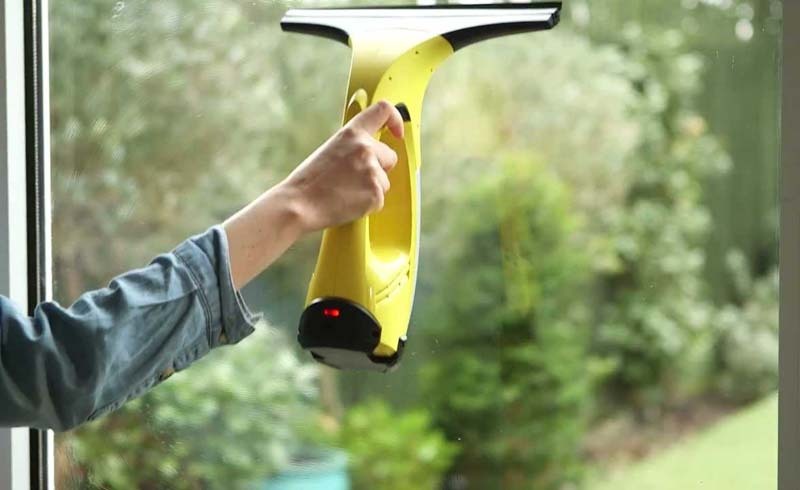 Cleaning sprays are good for small cleaning jobs or in between major washing days however, to wash all of your windows (and glass doors), the spray method may take a long time and isn’t as effective as soapy water. Paper towels can leave lint or streaks, so a squeegee works better. Newspaper has been a traditional way to wipe windows clean and here’s why: newspaper is rather absorbent and rough, similar to paper towels, and can act like a mild abrasive. Newspaper is plentiful, compostable, and cheap. The inks used today tend to not smudge as much as older newspapers in the past, but if you use newspaper you’ll want to make sure the ink or dyes don’t accidentally rub against painted walls or wood. Some find that newspaper can leave a gray residue on windows but others find it to be a great way to clean glass. But again, if you really want a pro finish on your windows, you’ll want soap and water, brush and squeegee. As far as DIY projects go, washing your windows is fairly easy and straightforward. Like any DIY project, you’ll have greater success if you purchase the right tools for the job and spend some time prepping your area. Remove screens, awnings, or anything that is in the way. Get out a sturdy ladder and have some drop cloths ready for your indoor spaces. You’ll want to purchase a washing brush or strip applicator (this is a soft, absorbent tool for applying the soapy water and rubbing off dirt), a squeegee (a rubber tipped tool for removing the water and leaving behind dry glass), a long handled extension pole (for reaching tall windows), and a dry cloth for wiping off the squeegee and removing drips. If your windows have small panes, be sure your washing brush and squeegee will fit in between the panes. Add to this supply list a bucket large enough for your washing brush, warm water, and washing soap (consider a biodegradable soap). You only need a small squirt of soap for a bucket of water – you don’t want too many suds as it can leave the windows cloudy. To wash the windows, simply mix the soap and water, dip the washing brush or strip applicator in the mixture and rub the entire window. Once you’ve washed the window, use the squeegee to wipe off the soap and water. Use your dry cloth to wipe off any excess water. Contrary to what you might think, it’s best to wash your windows on a cloudy day so that the heat of the sun doesn’t dry the soap and water too quickly. If you think that you don’t have time to wash your windows properly, or aren’t physically able to do them, there are many qualified professional window washers on Porch. Before you call a pro, count how many windows you need washed and note how many on the ground floor versus how many on upper floors. The professional will most likely give you a price quote based on the number of windows or about how many hours it will take to wash them. Also let them know if they will need to remove any awnings or screens or if you have multi-paned windows, which may take longer to clean. Happy cleaning!